When your bike runs like a champ but looks clapped out, Acerbis has your back with their Full Plastic Kits to make your machine look young again. 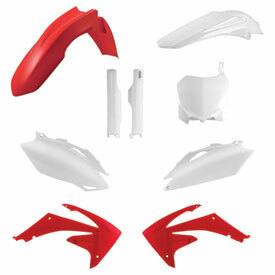 These kits are formed to the original factory shape and dimension to fit your ride perfectly without any hassle. Several colors are available including matching factory colors for certain model years. Acerbis plastics are made from the best materials so your bike will be ready to go with renewed looks with an added measure of protection. Items in kit may vary based on model. great fit ,quick delivery !!! the number plates fit perfectly !!!! . always liked their products. shipped to my house in two day . Nothing like new plastics to fresh up your ride! Look good! feel good! ride good! Wanted a full replacement plastics kit for my bike. All pieces, fenders, etc matched the OEM plastics perfectly. Colors were also a perfect match as well as figment. Not a bad price for a complete kit. Very good quality too. I was especially glad that it came with the airbox cover piece of the left number plate for my KTM. Good quality looks factory would highly recommend for a restoration or just to freshen up the look of your bike. This plastic kit made my 10-year-old bike look brand new. It was a great upgrade and helped sell my bike. My only complaint was the plastic scratched super easily. Good quality and fits really well, BUT.....does not come with air box covers. RM was very helpful in getting them for me but I was not really happy with having to purchase another $60 worth of parts to finish what is called a "complete" plastics kit. Don't call it a "Full kit" if it doesn't come with air box side panels. Full plastic kit means every piece for the bike. I like absolutely nothing about this plastic kit. Absolutely nothing provided in the kit fits on my 2014 ktm 250sx as it should....big gaps where plastic panels meet etc. Spend the money and get OEM plastics. I will NEVER buy this brand again...this product aside. rocky mountain atv is awesome as usual. 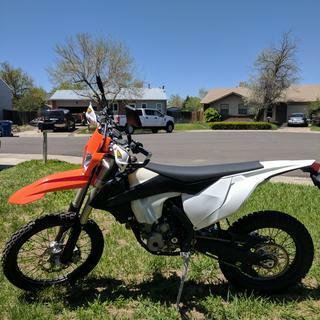 I recently purchased the FLO ORANGE plastics for my 2018 KTM 300xc. The color is awesome.It pops way more than pictures show. The plastics dont come with all of the knick knacks you may need for installation. This being said you can transfer them from your stock plastics. This being said for the price you pay, they really should be ready to install right onto the bike. Aside from the petty install discrepancy my biggest complaint is durability. The front fender was ripped off in a low speed crash at endurocross in Boise. I have also noticed one of my shrouds is broken where it mounts to the radiator as well. Having ridden the stock plastics for a full season of racing and having no issues, made me realize that these plastics should have lasted longer than 3 months. I would recommend this product cause the price is right. It gets three stars cause when I bolted the kit on my bike, the front fender was twisted out of shape. Fit, color, and design is exactly as OEM. Great products by Acerbis as always. Came with extras like washers where bolts go through just like OEM. Side number plates also come with heat shield and rubber piece on exhaust side. Perfect fit on my ktm and easy to install. It took about 30 min to take apart old plastics and install new. Even the air box cover fit perfect! 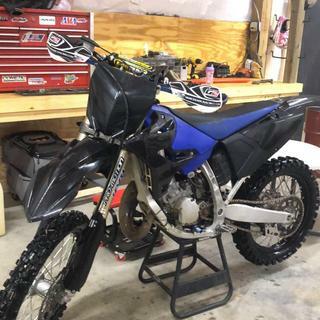 -m-2016 YAMAHA YZ125-- over all I have had pretty good luck with these plastics. Rocky Mountain ATV mc have made sure I was satisfied with the things that were ordered. But great plastics set and nothing left out or damaged during shipping. Was not too thrilled with this kit. For the cost you figure you would get like OEM fit, however that is not the case. All the bolt holes line up, but there are big spaces in between where plastics should line up and create gaps that should not be there. Overall, the quality is decent but it’s not as good as it should be for the price. Pretty close fit to OEM. Nice looking and good quality. It fit very similar to the OEM, you cannot tell the difference, looks and fits oem. I will definitely be purchasing on the next bike! Have used on several bikes. Not always 100%perfect fit but close enough. Works great for less costs. 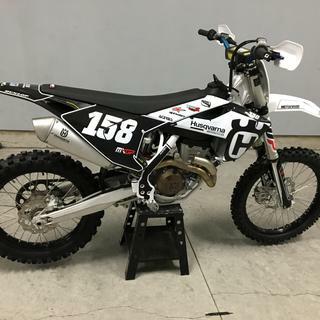 Love this kit, makes the bike look great, cant wait to see it with the graphics mounted. 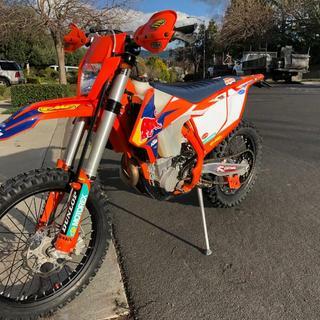 One major gripe is that fitment is not great probably mostly because of the obtuse design that KTM came up with (have to completely remove the subframe to install the airbox assembly and it slips OVER the subframe rails.. WTH??). The airbox lid does not fit up properly but somehow stays in place (it showed up warped). Still would highly recommend this kit as the price for the return is great. Wife said i could get another bike, so i did. I wanted it to be different, so a body kit was perfect. i kept the original plastics and changed to a new black out option. everything fit to a 't' and was in great shape. these are excellent to protect your bike and keep it looking great. They fit very well and are very reliable and do not break easy. These are a great way to make your bike look fresh again. I always have good luck with Acerbis products. I will never shop anywhere else now!! I have ton's of friends who ride and I will definitely share my experience with them! The part that we didn't like was the fact that Acerbis does not make a black airbox for the ktm 65. I would recommend the Acerbis plastic set. It is excellent quality. The price point was good, and recieved it three days earlier than was anticipated. For the price, these cannot be beat in my opinion. I expected some filing of the holes for fitment and was wrong. Every panel I had went right on with no issues. 2013 kx450f kit doesn't come with airbox covers as they are literally part of the whole airbox as a heads up. I was satisfied in the look and the durability. They are comparable to the factory. Everything fit correctly and looks great. Highly recommended if you need a new plastic kit. bought the full set for my bike. This kit fit better than the original plastics did ...lol....great product for the price. 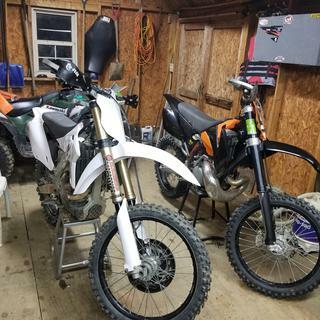 After spending better than a year looking for plastics for my sons 2014 Husqvarna TC85, I finally find them in the USA, ordered them, two days latter they show up at my door, I put them on the same night and they fit perfect, they look perfect, so they must be perfect, not to mention the price was perfect, the ones I did find over seas was a lil more in price but the shipping was way more than I wanted to spend. So at the end of the day he’s happy and so am I.
i buy a this set everythime i sell a bike to clean it up. no issues at all. Fits perfect on my 2013 Ktm 300 xc. I would recommend to anyone looking for new plastics. Acerbis plastic was a perfect fit. Is the color the same as OEM?? 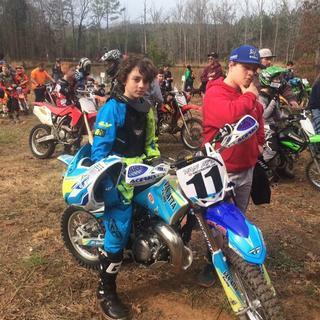 In the picture for a 2012 yz250f (original blue 11/12)it looks darker shade of blue but with a bright shine. BEST ANSWER: If it’s not the same, it’s as close as possible. I got the Original 15 package for my 2015 YZ250. The original plastic is scratched up and dull so it’s hard to be absolutely sure, but it looks pretty close to a perfect match when held side-by-side. I got the OEM "Kawi green" and id have to say color wise was probably a 99% match with OEM. Does this kit include airbox cover for my bike? BEST ANSWER: Yes it does in the FULL kit. BEST ANSWER: Our FULL plastic kit includes the air box covers. Does this come with the bolts to secure it? BEST ANSWER: No the Acebis plastic kits do not come with the bolts. You have to use your stock OEM bolts and washers. No bolts you just use the stock ones. If you have lost some you might want to consider buying a bolt kit. No you will need to either need to use the OEM bolts or buy a bolt kit. Hi Joe, I can't remember for sure, but I don't think that it did. I think all the bolts swapped over. What didnt came with the kit. 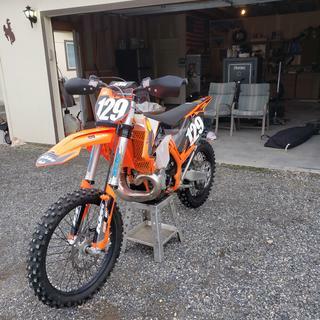 if i buy this kit for my 2014 ktm 300 xc does it include the air box covers? BEST ANSWER: YES on KTMs the air box and side plates are included in the kit. Yes it does. You have to change out the quick lock pins from your old set though. 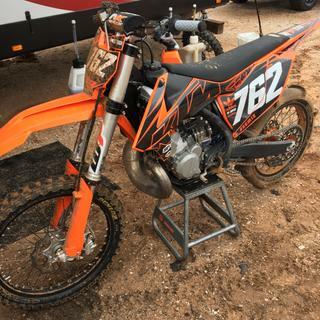 2008 KTM 450 EXC-r; does the kit include a headlight shroud or just a number plate? BEST ANSWER: Neither, we only sell this in the standard plastic kit. Front, rear, shrouds and side panels. Just the number plate is all that came with the kit I ordered. 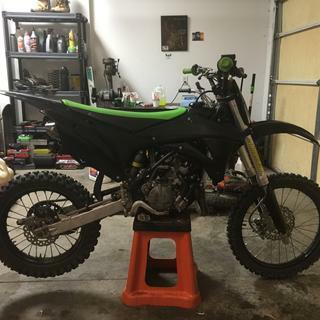 Will this work as a conversion kit on my 2008 kx450? If not where/how can I find one? I do not believe it will. The radiator shroud mounting points and side plate mounting points are completely off. In my experience, this kit will only fit from 2013 through 2015. The fork guards and front fender may work though. It doesn't look like they are a direct replacement from 08-09, according to a thread on Thumper Talk. Have you checked the OEM parts on RMATV. I've had great luck there. 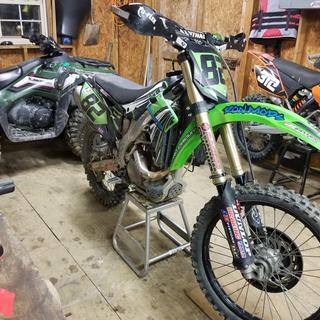 Only a plastic kit made for a 2007 or 2008 kx 450 will work, plastic from other bikes or models will not be a direct replacement. Is this kit all flo green or only certain pieces? BEST ANSWER: It will depend on your machine/application, but if you select a machine from the make/model/year drop downs a part specific picture will appear and you'll be able to see which body panels are florescent. 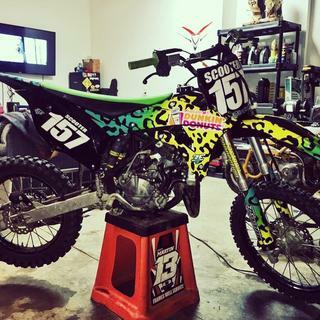 If the kit your looking at is for the 13-15 kx450 then the front front fender and front number plate is flo green. If it's for the 16 kx450 then the whole kit is flo green. Hope this helps. Hi the kit we purchased was all green and the fit was good. Does the 2017 HUSQVARNA TX 300 Full Plastic Kit come with metal fasteners that snap into the frame on the air box side panel? BEST ANSWER: Not sure how they are for the 17 but my 13 did not and I had to use screws. Just takes a little longer but I think Nihilo makes a kit to make it snap like factory again. Just received a full kit for my TX300, it does come with the metal fasteners on the side plates. No need to transfer them from the OEM plastics. 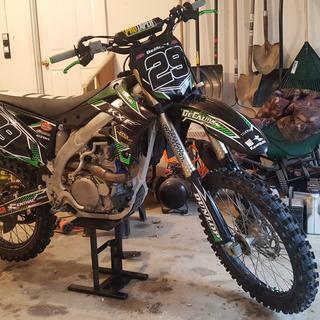 Is there an airbox cover for 2013 kx250f?? 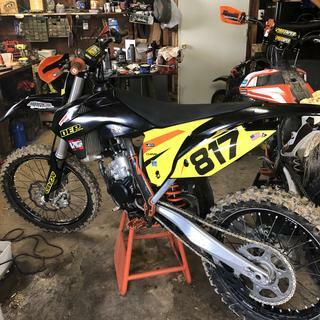 BEST ANSWER: I purchased the full kit for my 2013 250 sx and it included every piece of plastic on the bike except for the gas tank and frame guards. The pictures in the catalog for my model did not show everything included so I called customer service and they were very help full. Hope that helps. I bought the kit for a 2012 Honda CRF 250R and it came with the air box covers. Yes. It's part of each side cover (number plate). Air box covers DO come in the full kit. BEST ANSWER: RM told me that none of the Acerbis kits come with air box covers. Just the side number plates not the airbix. which green show us better, is it the green or flouresent green for a kx? BEST ANSWER: What year, make and model is your machine? I am trying to find a graphic kit for this plastic kit. Do you know which ones will match up??? 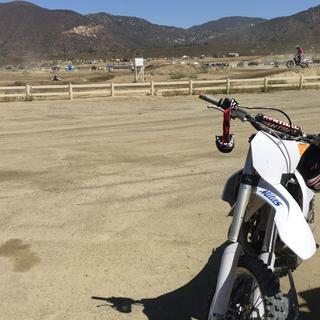 BEST ANSWER: We ordered the Acerbis kit for a 2016 YZ125 two years ago; they held up very well. We also use Factory Backing for our graphics; no problems with the fit. You may also want to check out Hole-Shot or 760 Design for graphics too. I bought these a yr ago but def need some graphics, I will check into your suggestions, thanks for the reply!! 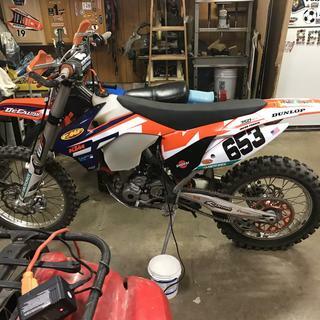 Could I use this as a conversion kit for a 2005 ktm 125 sx? 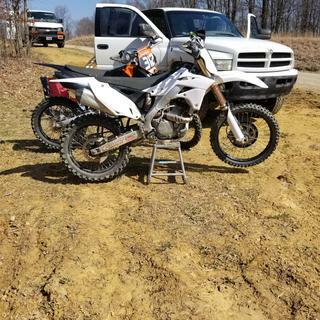 I have a 2012 Husaberg TE250. Will the KTM 2012 250XC be the same fit? BEST ANSWER: Don't believe so,i think Husabergs have different shrouds and if it also has the plastic subframe airbox covers may be different also. does this come with the air box and air box cover for 2017 ktm 300xc? BEST ANSWER: Air box cover yes, but not the airbox. Please confirm if this kit includes front fork protectors? The image and description states that it does but I want to be certain. 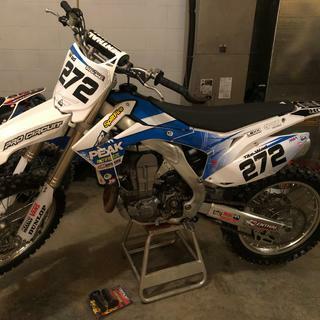 Does the 2018 yz 250f work for the light blue plastics? BEST ANSWER: That will not. 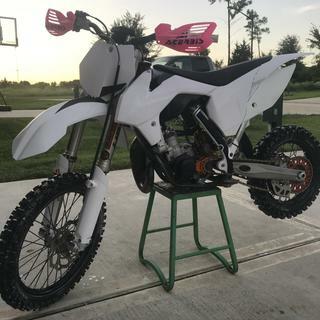 I am looking for a full white kit for my sons 2018 Yz85? Do you sell one?? BEST ANSWER: Just type in the make, model and year in the bike finder and you will see all the products that fit that bike. Does this kit include air box cover ? BEST ANSWER: I can't tell which kit you are referring too. But if you plug in your make, model and year the picture will show what all in included in the FULL kits. 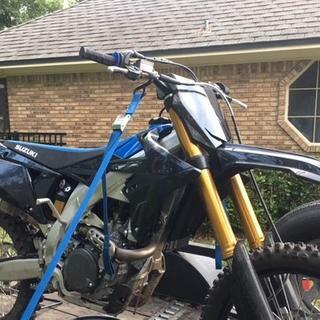 Will this fit a drz 125? Is the Air box cover ( left side ) included ? BEST ANSWER: We do not make a FULL plastic for the 2008-2011 XC-W, so the air box cover does not come with it. I have a 2009 kx250f .I want the black up top . Will they fit even though it says 10/11? BEST ANSWER: The 10/11 just means those were the OEM/stock colors for the 2009-12, so yes they will fit. Does it come with all the 2016 crf plastic? Is the air box plastic included? BEST ANSWER: The 2016 kit does not include the air box cover. How many pieces is this kit? Does the airshrouds come w the offset colors? Blue w black end? 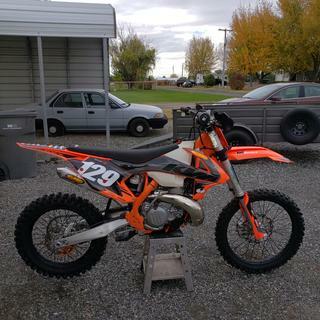 Do you do a kit to convert 2010 klx450r to a newer model kx? Mainly rear end? Why doesn't anybody include airbox covers for CRFs with their kits? BEST ANSWER: We have 2 kits; a Full plastic kit that includes everything (no air box covers) and a standard which is only the front,rear, shrouds and side panels. Not everyone replaces the air box covers, and its an addition amount to include those. But for 2019 Honda changed the lower fork covers so we had to create a new part numbers and we DID include the air box covers so that increased the kit price by $35. What is the difference between the original 16 and original 17 replacement plastic for the 2016 KTM 65 sx? BEST ANSWER: Its the same plastics, just different colors. 2017 have white/black shrouds and orange lower fork covers. 2016 (2018 is the same) have all orange shrouds and white lower fork covers. The rest of the pieces of the bike are the same colors. 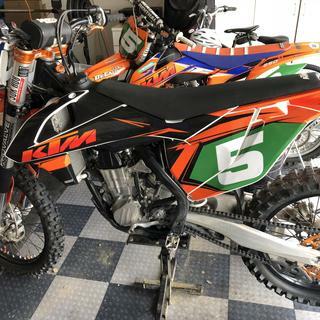 When will the all black kits for 2019 ktm 450 sxf be available? Other colors? BEST ANSWER: Unfortunately we don't have an ETA at this time.